A New York State Senate candidate who sparked a firestorm after telling the I-Team he was planning to hand out "Kool Aid, KFC and watermelons" at a campaign event in Harlem faces new accusations over an alleged rental scam. 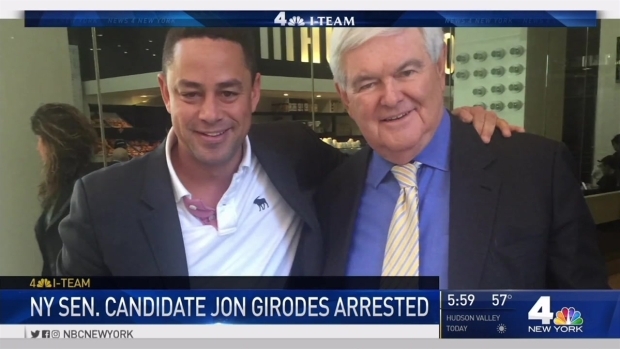 On Wednesday, a Manhattan grand jury indicted 38-year-old Jon Girodes, the Republican candidate for New York’s 30th District in the November election, on grand larceny charges in connection with a suspected scheme where he allegedly stiffed renters out of deposit money for a midtown apartment and then left them with no place to live. Girodes remained in jail, unable to post the $75,000 bond. His attorney has not responded to repeated requests for comment. The I-Team spoke with nearly a dozen people who responded to a Craigslist ad, discovering later that Girodes rented them the same apartment, at the same time. They said he made excuses why they couldn’t move in, leaving them homeless. A New York State Senate candidate who sparked a firestorm after telling the I-Team he was planning to hand out "Kool Aid, KFC and watermelons" at a campaign event in Harlem has been arrested on grand larceny charges in connection to an alleged rental scam. Sarah Wallace reports. "I was literally on 42nd Street, in tears, crying, because I had no idea what to do. Nowhere to go," said Amanda Stevens. All of the alleged victims said Girodes claimed he owned the 26th floor condominium with the sprawling views of the Hudson. Sources connected to the building management told the I-Team Girodes does not own the apartment and rented it from an individual owner.They added he had not paid rent for several months. Alleged victims said he bragged about his political ties, and showed them a large photograph of him in front of the Apollo Theater placed in the front hall of the apartment. 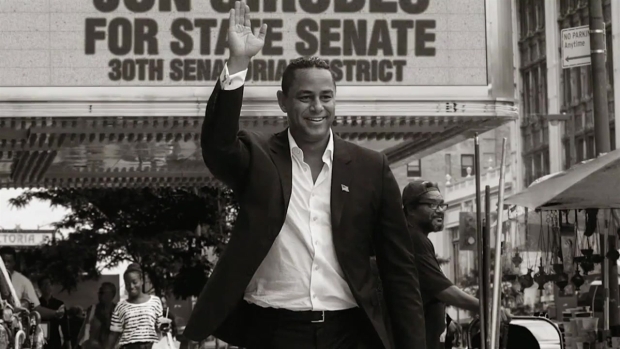 Joe Girodes, the state Senate candidate who promised "Kool-Aid, KFC and watermelon" at a Harlem campaign event, was arrested Friday night in an alleged rental scam he's accused of running. Asked about the fried chicken reference, he tells Sarah Wallace, "I know I'm hungry now." Another alleged victim who is disabled and on worker’s compensation, lost $15,000 in the alleged scam. The man, who asked not to be identified, said he put down advance rent for several months along with a move-in deposit. When he pressed to get his money back, he claimed Girodes threatened him during phone calls. Attorney Pierre Gooding, who represents more than a dozen alleged victims pro bono, said many have been threatened and worried about coming forward. Gooding said he has received additional complaints about Girodes from out-of-state residents. The disabled man who lost $15,000 said he came forward to make sure Girodes doesn’t hurt other people. “He won’t stop unless people are aware of this,” he said. Girodes’ campaign website and social media pages were taken down after the I-Team started its investigation. It's not clear if he plans on staying in the race. He has repeatedly claimed he's the victim of a conspiracy. He also stated he was the victim of a rental scam but did not offer details. Girodes, who failed to show up for scheduled on-camera interviews, defended his remarks in a phone conversation to the I-Team. Harlem residents expressed outrage, calling the comments racist and stereotypical.